The Westchester County Source Separation Law requires all businesses, institutions and schools in Westchester to separate recyclables from their trash. Westchester County is taking a proactive stance with the enforcement of this law, which is conducted through a multi-step program of inspections, violation notices and ultimately fines. Reduced costs for garbage collection due to the decreased amount of garbage to be collected. 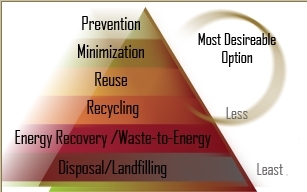 Read the Getting Down to Business: Recycling and Waste Reduction in the Office brochure to learn how to implement a recycling program at work. Designate a Program Coordinator to act as liaison between management, employees and your hauler. Analyze your trash and contact your hauler – a typical office will generate half a pound of paper per employee each day. Develop an internal collection system to encourage participation and make recycling convenient. Organize an employee education program to sustain employee participation and keep them informed. Recycling bin labels are available to be printed and posted directly onto containers. Get or give away usable items like computers, office furniture, office equipment and supplies. Shred Confidential Documents: Protect your business and identity by hiring a paper shredding and hauling service. Establish policies endorsing double-sided copying and set printers to default to doublesided printing. Designate a supply closet for reusable office supplies (such as file folders, pens and pencils, scrap paper and packing material). You can reduce your paper consumption by visiting catalogchoice.org, which lets you control the catalogs, coupons, credit offers, phone books, fliers, circulars, newsletters, and other unsolicited mail you receive. Old products can also be donated to reduce additions to the waste stream. Many charities accept old furniture and other items for reuse. Old office furniture can also be resold or given away, to save money and resources. Search online for organizations that specialize in these services.